The R-PLEX Human Mesothelin Antibody Set includes a matched capture and detection antibody pair and calibrator for the quick and easy measurement of Mesothelin in biological samples. R-PLEX products leverage MSD’s electrochemiluminescence technology for better sensitivity and a larger dynamic range than traditional ELISAs. R-PLEX matched antibody sets enable the development of singleplex and multiplex immunoassays. Individual assays may be developed using MSD avidin- or streptavidin-coated plates. Custom multiplex assays with any combination of R-PLEX analytes, as well as R-PLEX plus U-PLEX analytes can be developed on U-PLEX MULTI-SPOT plates. To learn more about the advantages of R-PLEX products click here. 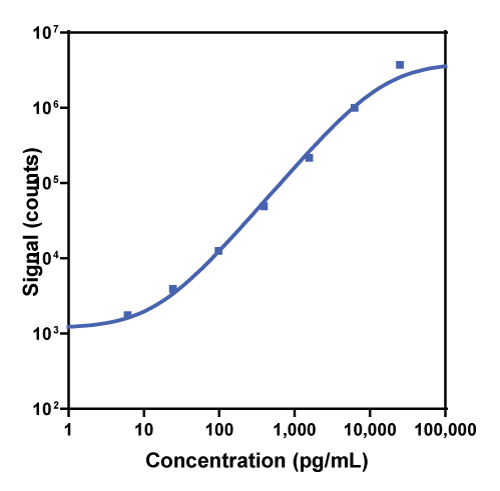 Calibration curve for the R-PLEX Human Mesothelin Antibody Set was assessed and representative data is presented below. Description - Mesothelin (MLSN, MPF, SMRP) is the product of proteolytic cleavage of the precursor protein encoded by the MLSN gene. Cleavage of the precursor protein results in the liberation of the soluble megakaryocyte potentiating factor and the cell surface protein mesothelin. Mesothelin is anchored to the cell through a GPI anchor and is over expressed in several types of cancers including mesothelioma, some adenocarcinomas and carcinomas. Mesothelin may be involved with cancer growth and progression.